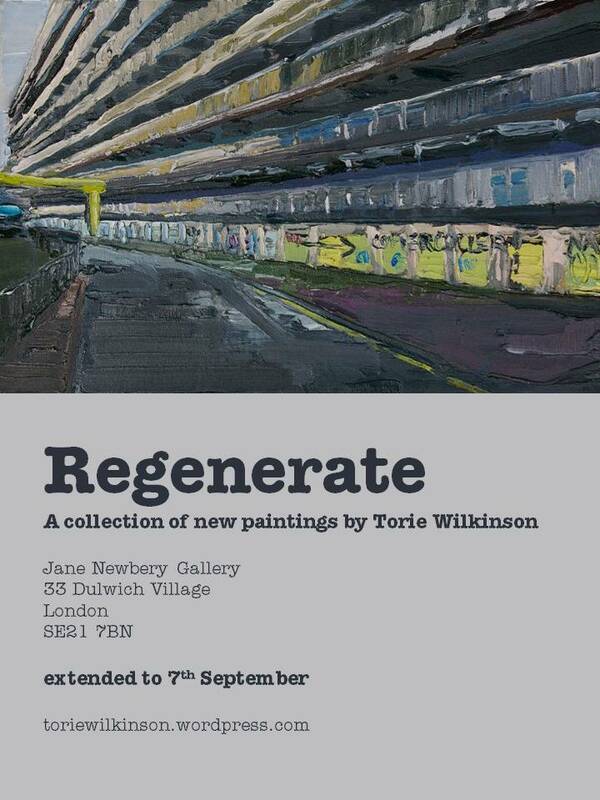 My solo show at Jane Newbery in Dulwich has been extended for another month and now closes on the 7th September. There is also going to be a small re-hang at the end of this week as I replace some of the pictures that have already sold. Please do come along and take a look if you are in the area. I’m having a solo show at the Jane Newbery Gallery in Dulwich. 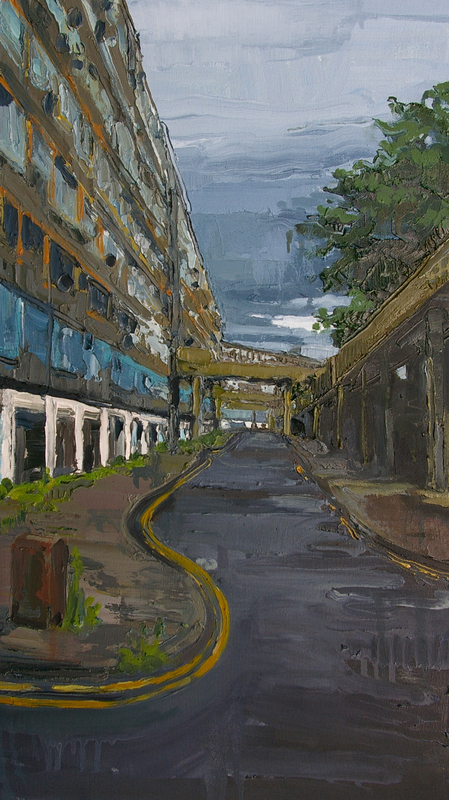 This time my work is largely focussed around two sites, the Heygate in Elephant and Castle and the Folkestone Harbour train station (Folkestone being my home town). Both sites are unused at present and waiting for something to happen. 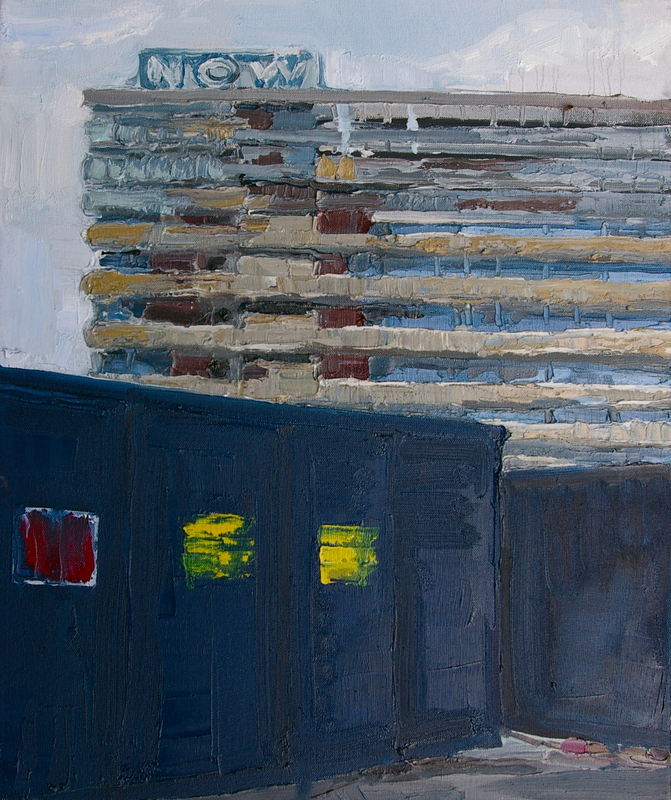 The Heygate is closed up and waiting to be demolished as part of the Elephant and Castle regeneration program. I believe the planning stage is happening around now. 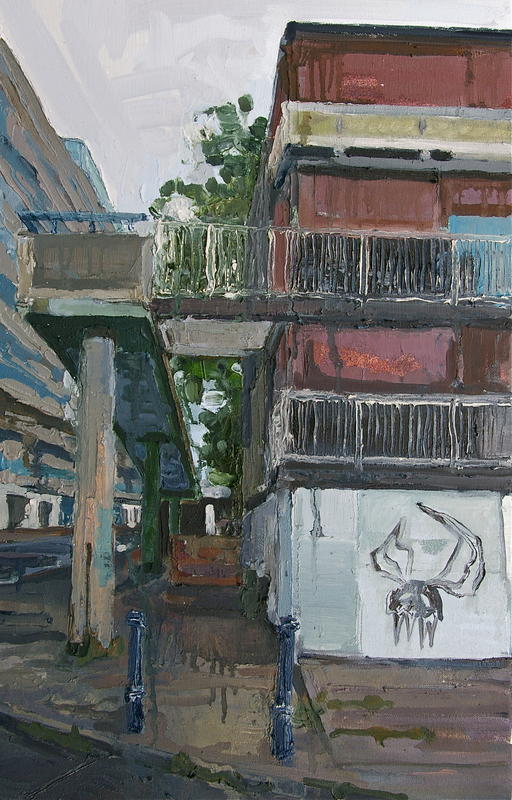 I’ve lived in South East London for around eight years and I have painted the Heygate on several occasions before as the residents slowly moved out and it was boarded up. However, I wanted to devote a bit more time to it now as it is about to disappear forever. Folkestone Harbour Station I was almost unaware of when I was growing up in Folkestone. It was nestled in behind some fun fair rides and a large Sunday market. Last year as part of the Folkestone Triennial there was an exhibit located within the old station and that was the first time I had ever ventured in. Since then I have been back several times to document it. The Harbour Station was once a major point of departure for First World War troops whilst also being the station that the Orient Express passed through on it’s way to France. 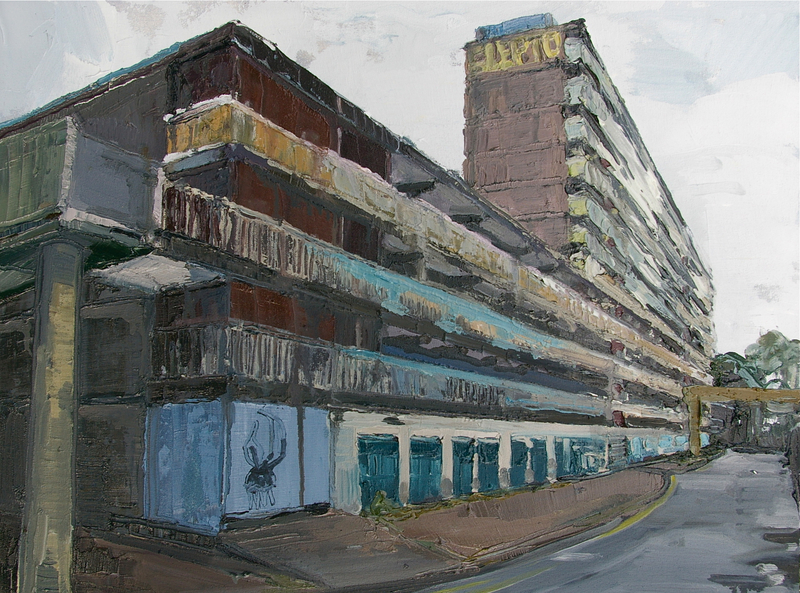 Now like the Heygate it awaits the future. There seem to be two possible versions. 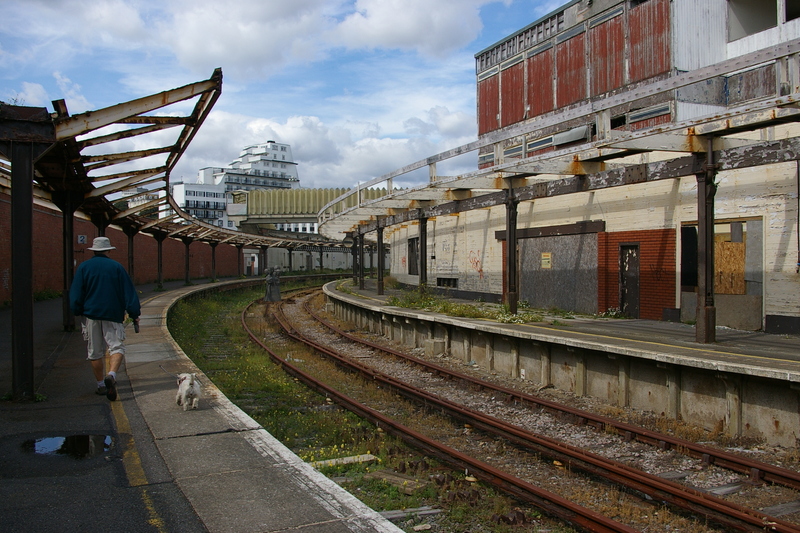 One would have the station demolished and the area converted into a marina as part of a wider regeneration plan for Folkestone (much like Elephant and Castle). The other sees the station survive as a visitor attraction with a ‘Leaving for War’ museum. In the meantime it gently decays. A while ago an idea for a painting was suggested to me. It was a little area near the Elephant and Castle where there are some interesting enclosed courtyards. The type often used by small businesses, photographers, designers etc. In this case the spot was special because it was also the place where some friends, about to be married had met. I was vaguely aware of the area and I wanted an excuse to walk around and see what is happening in general since it is going through such a transformation at the moment. 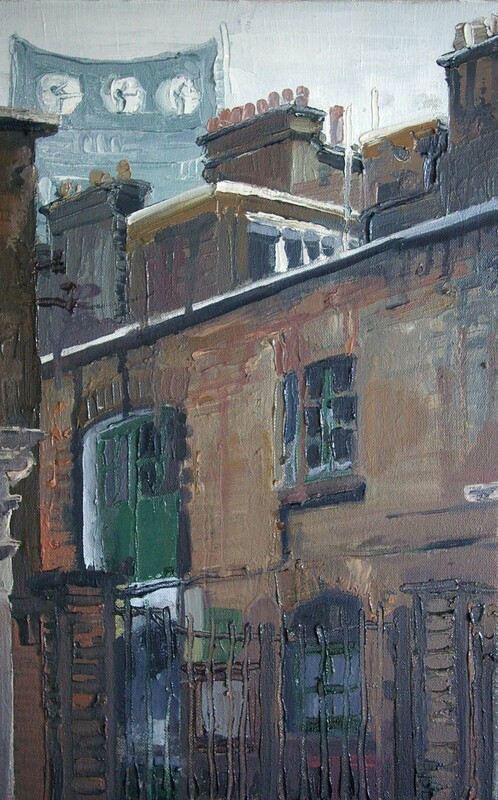 I spotted a courtyard in the back streets and loved the contrast between the older buildings and the new regeneration peeking through. And then, pleasingly I realised it was in fact the place I was looking for. 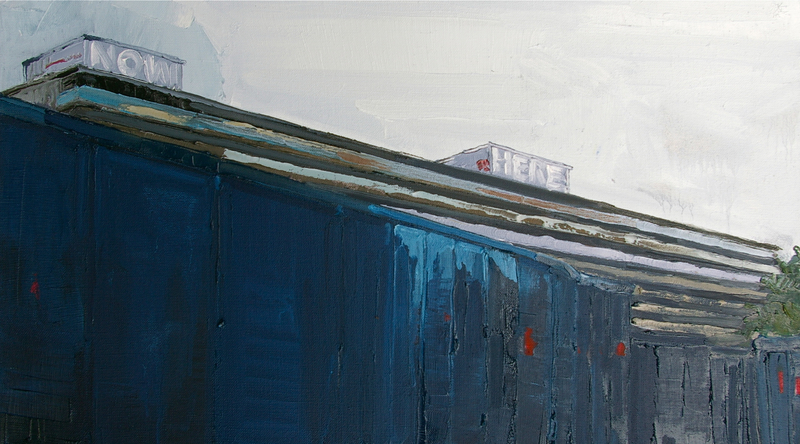 Here is the painting I subsequently made. I had a walk around the wider area, looking at all the new buildings going up and also at the Heygate which is so striking and desolate now. 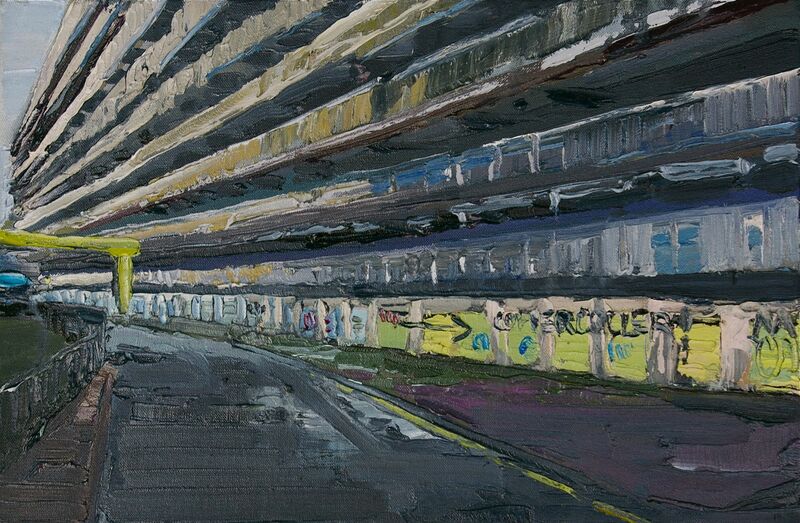 I had quite a few ideas for new work out of all the contrasts and change. So all in all a interesting afternoon.